Ah, that headline doesn't really do this game justice. Copper Country is an incredible looking board game set in Michigan's Upper Peninsula, well the Keewenaw Peninsula to be precise. The game is designed by two Yoopers, David Lankton and Scott Diehl. The year is 1840 and America's first mining boom is about to change Michigan's Upper Peninsula forever. Take on the role of a mining company and compete for copper by casting miners and machines into the underground lottery. As the industry grows, so do the communities surrounding your mines. But every attempt to wrest copper from the ground hangs the fortunes of your company, and the lives of your miners, in the balance. Life, Work, Profit, Death: Copper Country. The passion these two guys have in seeing this game become a reality is evident throughout the presentation and look of Copper Country. David's dad, Larry Lankton, taught Copper Country history at Michigan Tech University in addition to researching and writing books on the subject. He passed that love of the area's history to his son and he, in turn, is attempting to pass it along through his love of board games. I've pored over the Kickstarter page, looked over the game components, and studied how the game plays out. I have to say, this is probably the best looking and well thought out board game project I have seen on Kickstarter. This game looks like it is ready to go - the guys just need funding to get it printed and shipped. I collect and play a large number of board games and it's funny, but just this week I was trying to dream up (while building a bunch of our great gift baskets) a board game set in Michigan. Then, I happened to stumble upon Copper Country last night. Copper Country knocks it out of the park with its theme, artwork, and gameplay. I can't wait to add this to my collection and get it into our game night rotation. I can't wait for this game! Check out their Kickstarter and see for yourself. I already have ideas for creating a gift basket based around this game. Yep, you could say I'm a little bit excited to see this get funded! Say Ya to Copper Country, eh! Here's just a short and goofy list of the Top Five Michigan Halloween Traditions. Have fun tonight and try to stay dry if you're trick-or-treating here in Michigan. Happy Halloween, Everybody! 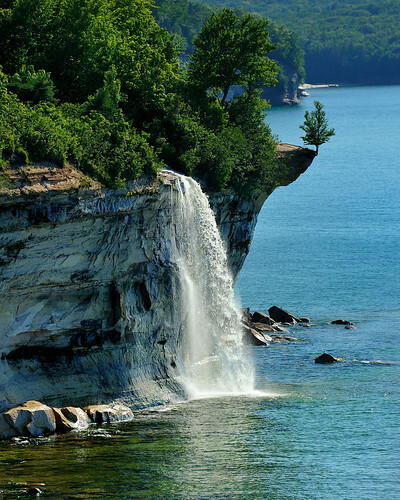 "Spray Falls" Michigan's Pictured Rocks National Lakeshore, a photo by Michigan Nut on Flickr. I love photographs like these that show off Michigan's diverse and beautiful landscape. It's always a treat to see the reactions from people that don't live in Michigan. They just can't believe a place like this exists here. What is your favorite Faygo flavor? Aretha Franklin singing the National Anthem. Was it my favorite version? No, but it was Aretha Franklin - the Queen of Soul. Joel Zumaya delivering the game ball. I had goosebumps when the strains of Hendrix's 'Voodoo Child' started playing over the loudspeakers. Magglio Ordonez limping onto the field to huge cheers during pregame introductions. It nearly brought me to tears. Home runs. They are a deliciously sweet thing when hit by your favorite team. The crowd singing along to Journey's "Don't Stop Believing". Dinner at Fishbones in Greektown. A quick ride from the parking ramp to Greektown and then back to Comerica Park on The People Mover. Better than walking, plus I got a quick tour of Detroit's downtown. It only costs $.50 per ride. How does this thing not get more riders? Oh, and today in Detroit Tigers history - this little gem happened :). I'll admit, my first reactions to the blown call by first base umpire Jim Joyce were no where near Armando Galarraga's as he lost his bid at a perfect game. Armando just smiled wryly, stepped back up on the mound, and threw five more pitches to get the 28th out of the game. Armando could have thrown his mitt in disgust, charged up to Jim Joyce, yelled at him, and then complained to reporters after the game. Instead, he smiles, calmly walks away, and goes about finishing the game. Then after the game when asked about the blown call, Armando responds, "Nobody's perfect." He wasn't being sarcastic or trying for irony with that statement. He was genuinely compassionate for the umpire and what he was going through knowing that he blew the biggest call in his career. Ya know, we all make mistakes in our jobs. I'm glad my mistakes aren't broadcast on tv, radio, and the internet. There is a lesson buried amongst all of the angst and anger we Tigers, and baseball fans in general, are feeling this morning. It was the ultimate show of not just good sportsmanship, but it was a lesson in how we should all react to adversity in our own lives. Rather than ranting and raving when things don't go our way or when we feel that we were wronged we should take a page from Galarraga - smile wryly, stand up straight, and with a look of determination - get back to it and do the best we can.